Trump has already spent almost double Obama's annual travel budget. 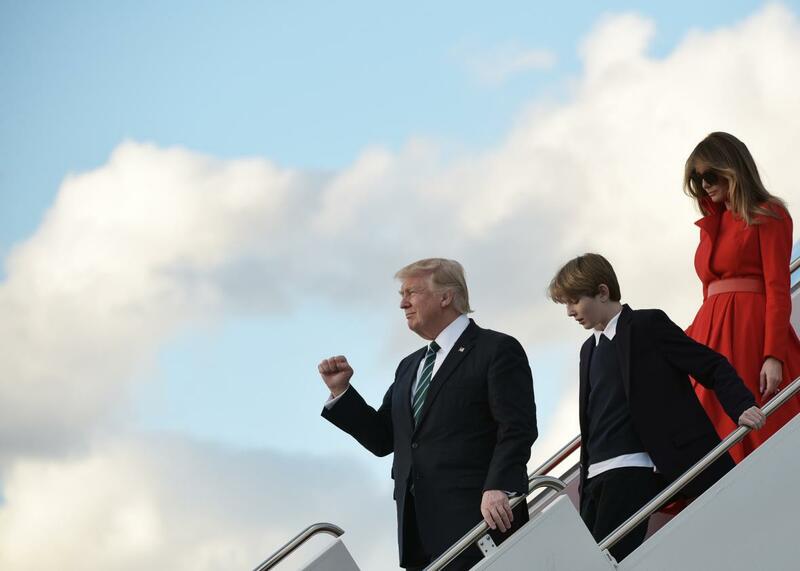 President Donald Trump, son Barron, and wife Melania step off Air Force One upon arrival at Palm Beach International Airport in West Palm Beach, Florida, on March 17. This marked the seventh weekend that President Trump spent at what he has come to call the “Winter White House” since taking office on Jan. 20. It is estimated that each of the president’s trips to Mar-a-Lago costs taxpayers around $3 million. Meaning that since taking office, Trump has already spent around $21 million in taxpayer cash for his weekend travels, which also double as great advertisements for his Trump-branded properties. In contrast, President Obama’s travel was estimated to have cost taxpayers somewhere between $85 million and $96 million, according to Public Citizen, a progressive advocacy group. Taking the highest estimate into account, that would translate into $12 million per year. If Trump keeps up the current pace of trips, he could spend $60 million in taxpayer cash solely to visit Mar-a-Lago this year. And, of course, that doesn’t even come close to estimating the full cost of protecting the president and his family. The most obvious additional cost involves first lady Melania Trump and son Barron, who are staying in New York at least until September. The New York Police Department has said it costs as much as $146,000 per day to protect the first family. Trump has visited a Trump-branded property on 28 of the days he has been president, “meaning that he visits a property that’s part of his private business empire more than one-third of the days he’s been in office, or once every 2.8 days,” notes the Washington Post. Many ethics experts have raised red flags about the way Trump is making sure his properties have a key mention in the history books. “President Donald Trump is diminishing the office of the presidency by turning himself into a walking advertisement for his global resort properties,” notes Public Citizen. Late last month, the Government Accountability Office said it was going to examine the travel costs of Trump’s frequent travels to the Florida resort. A group of Democratic lawmakers requested the investigation after reports that Trump discussed a North Korea missile launch in full view of guests.